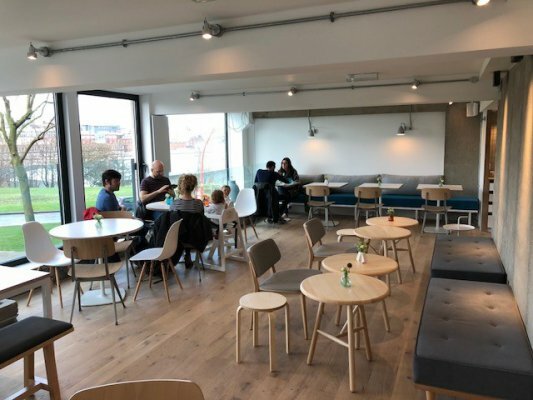 Park Hill has welcomed it’s first new cafe the South Street Kitchen which opened just before the Easter weekend. Located within the Phase 1 block and next to S1 Artspace’s current offices the space spreads over two floors with fantastic views over Sheffield City Centre. A 5 minute walk from Sheffield station. South Street Kitchen serves Middle Eastern-inspired vegetarian food, speciality coffee along with alcoholic beverages in the evening. It makes a great place for brunch, meetings and events. Alumno will soon be holding a sounding board to discuss its proposals for Park Hill with Sheffield students. Alumno can verify that the food is delicious. We look forward to many more visits.